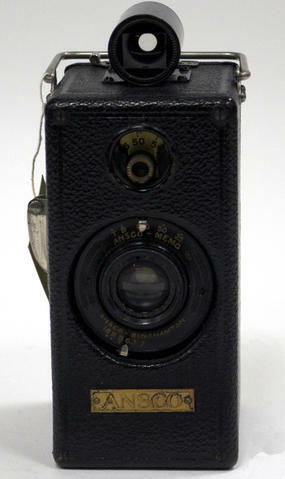 Item is a leather covered wooden box camera. The Ansco Memo is a single frame, fixed focus which takes landscape oriented images. Film is advanced by pushing down on a lever in the back of the camera. While not the first American camera made for 35mm film, it is the first to sell in abundant quantities.